Junior Trent Forster is a team captain for Santana this season. His great-uncle, Terry Forster, was the San Diego Section Player of the Year in baseball for the Sultans in 1970. SANTEE  The Forster family tree would be a natural fit among the championship banners at Santana High. One of Santana’s most famous alumni, Terry Forster, graduated in 1970 and pitched 16 years in the major leagues. Terry’s twin brother Larry and older brother Gary also played baseball for the Sultans. Gary’s son, Darrin, is a 1989 alumnus who earned a baseball scholarship to Grand Canyon University. The family tradition continues today as Darrin’s son, Trent, anchors a Santana football team looking to plant some postseason roots. 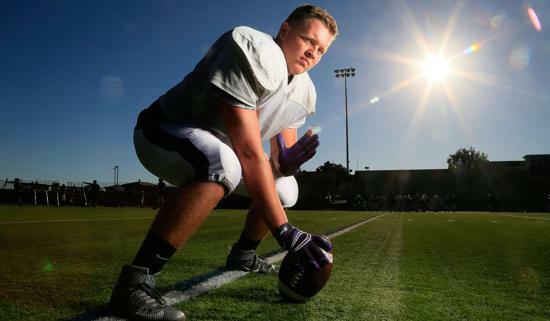 Trent, the Sultans’ 6-foot-2, 255-pound junior center and team captain, grew up dreaming about the day he’d wear a Santana uniform. Trent recalled a childhood full of stories about his father’s playoff performances and his great-uncle’s dominance on the mound. Instead of being afraid to live up to the family’s history, Trent said that the accomplishments have only motivated him more. While Terry’s left arm is what propelled him to fame, his resolve guided and inspired generations of Forsters. Darrin speaks fondly about how Terry was born with a back issue but didn’t let it stop him. Doctors told Terry that he’d never play sports, but he was driven to prove them wrong. While football wasn’t an option, Terry was known to throw the pigskin virtually the length of the field. With that arm strength, high school hitters didn’t stand a chance. Batters used to celebrate hitting foul balls off Terry, who was drafted in 1970 and made his big league debut the following year. While it’s fun rehashing Terry’s career or his own glory days, Darrin said he gets more enjoyment watching Trent wear the purple and gold proudly. Trent played baseball his freshman year, but was more drawn to football. That hard-working Forster spirit paid off as he cracked the starting lineup as a sophomore and was named team captain this season. In addition to leading the Sultans on the gridiron, Trent carries a 4.4 GPA and is weighing his college options. Trent leads a Santana team that plans to build off last year’s 7-5 record. The Sultans defeated Central in the first round of the San Diego Section Division IV playoffs for the school’s first postseason win since 2011. Trent joins a bevy of returning starters that includes running back Bobby Wallace, receiver Aidan Rasmussen and linebacker Spencer Gulihur. Josh Oedewaldt, the vice principal’s son, takes over at quarterback for Frankie Gutierrez, who graduated as one of the most decorated athletes in Santana history. The Forster story at Santana won’t end with Trent’s graduation. His younger brother Jared is an eighth-grader at Cajon Park Middle School. Dennis said Jared is “counting down the days” until he can take the field for the Sultans.